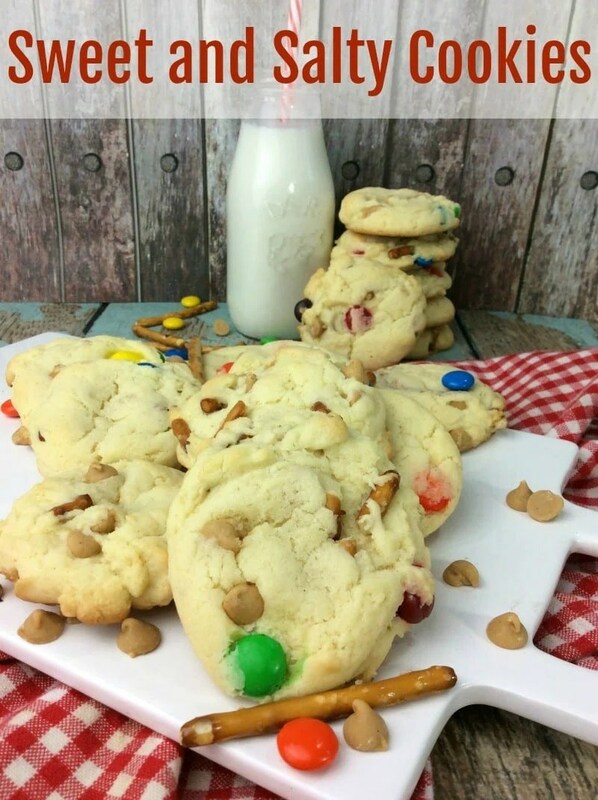 Combine the salty deliciousness of pretzels with the scrumptious sweet taste of M&M’s and butterscotch chips, and you’ve got yourself the perfect combination in one dessert: Sweet and Salty Cookies! This soft and chewy cookie will melt in your mouth and leave you craving for more! Add a glass of warm milk or hot chocolate and you’ve got yourself a perfect late-night snack! Being a dessert fanatic myself, I love the great taste of a traditional salty pretzel, and I’m always up for any kind of sweet treat (or a very sweet glass of wine)! This is the perfect cookie for those who want the best of both worlds mixed together into one perfect little dessert! Who knew pairing sweet and salty together could create such a perfect match? Combine the cake mix, oil, and eggs into a standing mixer fitted with a paddle attachment. Add in Reese baking chips, M&M, and pretzels. Take a small ice cream scoop and scoop some dough onto a parchment paper lined baking sheet, 2 inches apart. Transfer to a wire rack and let cool before enjoying. I hope you enjoyed the Sweet and Salty Cookies Recipe. If you make it, make sure to share with us on Facebook or Twitter! Also, check out all of our other Recipes. Mmmmm I haven’t tried these but I already know I love them, a little bit of everything and my favourite sweet and salty, yummmm!!! Hmm special cookies all right. I am a big fan of sweet and salty treats as the salt seems to accentuate the sweetness in such a tantalizing way! This looks divine! The perfect combo! I’m afraid this recipe’s not for me, I’ve got a sweet tooth and I don’t like Reese baking chips, M&M, nor pretzels – sorry! GAH! Another wicked looking cookie recipe. What are you doing to us? Yum! Thanks! Hoping you will make the recipe! Thank you for sharing your cookie recipe. They look delicious. I’ve never tried sweet and salty together in cookies, but it looks like an interesting recipe! Glad you enjoyed the cookies and thanks for sharing! I love the addition of pretzels in the cookies, I never would have thought to try that but I’m sure it’s delicious! Such a unique cookie recipe! I will have to try these as soon as this heatwave breaks in Alberta. These definitely sound like my kind of cookies. Thanks for sharing this recipe. Wow those look delicious! pinned! These sound wonderful. I would have never thought of putting chopped pretzels in cookies. This will be perfect for tonight. Dessert is my favorite part of the meal! Im writing up the list of ingredients now. These would make a great addition to our Christmas baking list! Interesting list of ingredients,I never had a cookie that contained pretzels . These sound like our favorite trail mix, so I’m sure we’d love them!